Can Bangalore win its battle against rubbish? The southern Indian city of Bangalore was long known as the garden city, famed for its lush public parks and gardens, trees and hedges. But four years ago, it was renamed the garbage city, after it began drowning under mounds of rubbish. Some concerned citizens, however, are working to clean up the city, writes the BBC's Geeta Pandey from Bangalore. On a Sunday morning, about two dozen young men and women arrive outside the Aishwarya Agate apartment complex in the JP Nagar district, armed with paint, buckets, brushes and rollers. For the next few hours, these volunteers from the non-governmental organisation Youth for Parivarthan (Youth for Change) get busy, trying to beautify the wall across the compound. Ugly fading pamphlets are peeled off, the grey wall is hosed clean with a jet of water, a coat of terracotta paint is applied, patterns are drawn with chalk and then painted over with fine brush-strokes. The volunteers include lawyers, engineers, accountants, students and even an actor. This is their 94th project, says Amith Amarnath, the group's founder and president. "We did our first project in June 2014. There was a small children's park near my home, filled with garbage. It would stink all the time, everyone was complaining about it," he told the BBC. "So one day, I thought we should stop complaining and start acting." Mr Amarnath and a few of his friends went and cleaned up the place. Then they painted the park walls and installed benches to dissuade people from throwing rubbish there again. Bangalore is often described as the Silicon Valley of India. The city has witnessed rapid growth in the past two decades. But along with that prosperity have come problems like traffic snarls and thousands of tonnes of daily garbage. The city of 11.5 million people daily generates 8,000 tonnes of rubbish which is collected and transported to landfills outside the city, says Bharath M Palavalli of Fields of View, a non-profit which has been working to create awareness about Bangalore's garbage problems. By law, this garbage should be segregated at source between wet food waste and dry recyclable waste like plastics and paper. "Ideally what happens in Vegas should remain in Vegas," says market researcher and civic evangelist V Ravichandar. "Garbage should be sorted and dealt with in the neighbourhood and only 15% should go to landfills." But civic authorities have long followed the policy of collecting and transporting all the city's garbage to nearby villages instead. The flaws of the policy became glaringly obvious in 2012 when garbage collectors went on a strike over a pay dispute with the civic authorities and the city began to drown in rubbish. Mr Ravichandar describes what happened next as "a perfect storm". "At the same time, one landfill was closed by the pollution control board for being environmentally hazardous, and another was shut down because local farmers protested. "For two weeks, untreated waste was being dumped on the city streets daily. It had been drizzling for days and there were things putrefying," says Mr Ravichandar. But that became the turning point for the city when it came to garbage management. With more awareness, residents in many areas have now begun to segregate their garbage and dry waste collection centres have come up in several neighbourhoods. "In areas where people are more aware and the residents' associations are strong, rubbish is getting picked up regularly and things have visibly improved," Mr Ravichandar says. But many "black spots" remain in the city - and that's where groups like Youth for Parivarthan come in. The wall across from the Aishwarya Agate apartment that the volunteers are beautifying today used to be a garbage dump until a few days ago. For the past 14 years, resident Purushottam Joshi says every time he stepped out of the gates, he would be greeted by the stench of rotting garbage. "We petitioned the local legislator, our MP, the district collector, even the police, but nothing happened. Now I'm very happy that these young men and women have done this wonderful work here," he says. 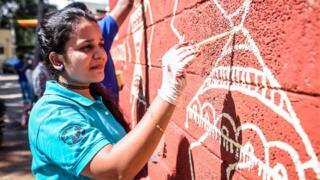 Home-maker Lavanya Shankar says she's "extremely happy" to see the "extremely clean" wall. "This is the street where we live, where our children play, and it's wonderful to see this change," she says. Mr Amarnath says their reward is the appreciation they receive from the public. "Initially we would spot places to fix, but now people write to us on social media, seeking our help. Earlier, people thought we were just jobless youth, with nothing to do. But ever since Prime Minister Narendra Modi launched his Swachch Bharat Abhiyan (Clean India Campaign), public support has been growing for us." As the volunteers pose for a photograph in front of the finished wall, they say they know that their efforts are like "a drop in the ocean". But, as Mr Amarnath says, "every drop must count". "If we want to see the change, we have to be more involved and aware. If we sit at home and think the government would do everything, then nothing would get done."